Gold prices surged higher after the U.S. Federal Reserve hiked rates last week, gaining $35 per ounce, or 2.7%. It was the perfect response to stocks. 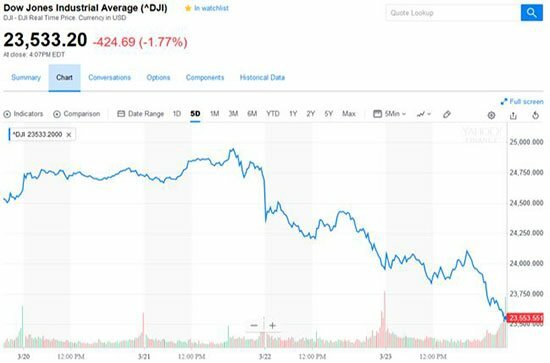 The stock market tumbled after Fed Chair Jerome Powell's press conference on Wednesday, then fell some more after U.S. President Donald Trump's latest tariff threats. Both events helped push gold prices higher, and they both showed us that they'll be long-term catalysts for gold prices in 2018. First, the Fed's rate hike helped send the price of gold higher. The stock market initially rallied after the Fed's rate hike announcement. But that reversed once Powell detailed his views, pushing stocks into the red. In short, Powell appeared more optimistic about the economy, and thus more hawkish on rates, than traders were prepared for. That's a sign the Fed should easily reach its expected total of three rates hikes in 2018, which will continue to push gold prices up. Second, Trump's threat to slap $50 billion in tariffs on Chinese imports over unfair acquisition of intellectual property affirmed we are at the start of a trade war. If Trump goes through with anti-China tariffs, it will raise the cost of living for Americans and could send stocks tumbling even more. And that's a form of inflation, which is always a boost for gold as investors look to protect their money. 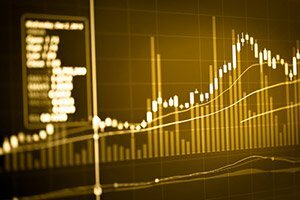 Now that the gold price rally is kicking into gear, I'll show you my latest gold price prediction for the second half of 2018. 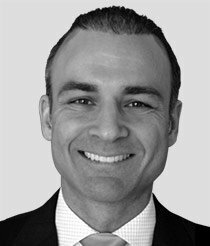 The week kicked off with what I'm calling "miner merger" on Monday (March 19). That's when two junior miner takeovers were announced. Hecla Mining Co. (NYSE: HL) agreed to buy Klondex Mines Ltd. (NYSE: KLDX) at a 59% premium. Then Alio Gold Inc. (TSX: ALO) said it would buy Rye Patch Gold Corp. (TSXV: RPM) for a 35% premium. Those mergers, along with a dollar sell-off, helped gold go from its open at $1,310 to a close of $1,317. 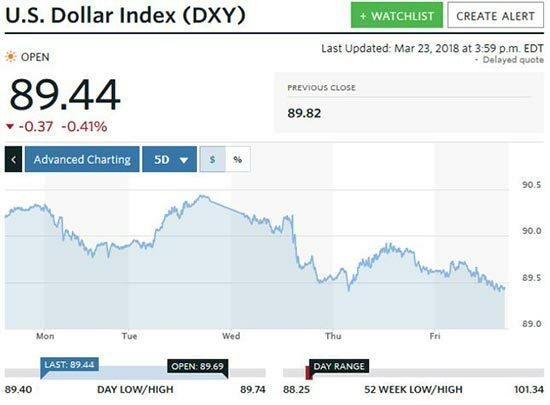 On Tuesday (March 20), those gains were undone as the U.S. Dollar Index (DXY) rallied from 89.90 to 90.43, as traders anticipated the next day's expected rate hike. Gold opened at $1,311 and worked sideways through the day to a flat NY close at $1,311. But the fireworks started on Wednesday (March 21), as gold traders looked forward to the rate hike news. Despite an initial bump in stocks, the markets turned lower on Powell's remarks and closed down for the day. But the DXY dropped from 90.2 to 90 after the rate hike, then worked its way down to 89.68 by 5:00 p.m. Gold rose steadily and strongly through the day, opening at $1,315 and climbing to $1,332 by 5:00 p.m.
Then, on Thursday (March 22), the stock market collapsed on the latest tariff announcement. The S&P 500 fell 2.5% while the Dow lost 724 points, or 2.93%, as selling intensified through the day. The DXY managed a small rally from 89.5 to 89.85, keeping gold in check as it opened at $1,329 and closed flat on the day. But overnight weakness returned to the dollar, and gold bounced. By Friday's (March 23) open, the DXY was at 89.61. Gold opened way up at $1,346, tested $1,350 early in the day, then closed flat at $1,346. It was a tremendous vote of confidence for the precious metal as a haven from stocks. The S&P 500 was down 2.1%, while the DOW lost 424 points. It was a rough week unless you owned gold, as the yellow metal was up 2.7% over those five trading days. And with at least two more rate hikes and a trade war with China looming, it's no surprise that I'm predicting gold prices will rise even higher.